November 21, 2017, ATLANTA, GA – Critically acclaimed electronic violinist Lindsey Stirling has invited the young artists of the Atlanta Music Project to perform with her in concert, tomorrow Wednesday November 22, 2017 at 8:00pm at the Cobb Energy Performing Arts Center. The sold out show is part of Stirling’s national “Warmer in the Winter Christmas” Tour, with over 30 shows in as many cities in support of her “Warmer in the Winter” Christmas album out now. For this concert AMP’s young artists will comprise the accompanying string orchestra, performing on four songs, including Ms. Stirling’s smash hit “Crystallize,” which counts 183 million views on YouTube and reached #1 on Billboard’s Dance/Electronic Chart and Classical Album Chart. This concert is AMP’s second collaboration with Ms. Stirling. In October of 2013, Ms. Stirling was compelled to raise funds to support AMP’s mission after learning about its intensive, tuition-free music education program focusing on underserved youth. Two (2) Lindsey Stirling/AMP “Power of Music” t-shirts were designed, produced, and sold with all proceeds benefitting the Atlanta Music Project. The fundraiser raised over $10,000 reaching its goal of providing music instruction for 50 AMP students. On Wednesday, many of the same students who benefitted from Ms. Stirling’s fundraiser will be performing alongside her. “What an amazing full circle. We are thrilled to see some of the same students Ms. Stirling helped so many years ago, now take the stage with her to show off the training that she helped them to receive. We are thankful for and humbled by Ms. Stirling’s continued generosity and support,” said Dantes Rameau, AMP’s Co-Founder and Executive Director. One of the “biggest artist development breakthrough stories,” Ms. Stirling counts 10 million YouTube subscribers, over 2 billion views on her YouTube channel, 2 Billboard Music Awards, sold out worldwide tours, and is currently in the finals of this season’s “Dancing With the Stars.” In 2016, Ms. Stirling’s memoir titled “The Only Pirate at the Party” debuted on the New York Times’ best-seller list. Founded in 2010, the Atlanta Music Project provides intensive, tuition-free music education for underserved youth right in their neighborhood. 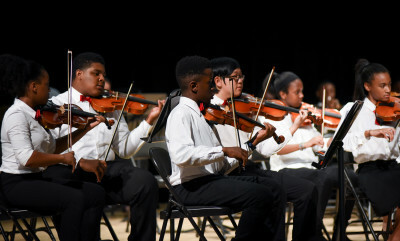 Now in its eighth year of programming and serving 300 students at six sites, AMP provides all its students with an instrument, a teaching artist, classes in Symphony Orchestra; AMPlify, the choral program of the Atlanta Music Project; the AMP Academy, providing advanced musical training to AMP’s most talented and dedicated students; and the AMP Summer Series, a music festival and school. AMP music ensembles perform 40 concerts per year. In 2015 Clayton State University established the Atlanta Music Project Endowed Scholarships, providing college scholarship funds for AMP students. AMP’s program partners include the City of Atlanta Department of Parks & Recreation, and The Kindezi Schools. AMP is the recipient of the prestigious 2016 Bank of America Neighborhood Builders award. In 2016 and 2017 the White House named AMP one of the top 50 after-school arts programs in the nation. For more information:www.atlantamusicproject.org. Lindsey Stirling is one of the biggest artist development breakthrough stories in recent years. An acclaimed violinist from Gilbert, Ariz., Lindsey has entered a futurist world of electronic big beats and animation, using her classical violin training to leap through the music industry with almost 10 million YouTube subscribers, over 2 billion views on her YouTube channel, 2 Billboard Music Awards, Billboard chart-topping hits and sold out tours worldwide. She’s created a new music world where modern classical meets the infectious energy of dance and electronica. On stage, Stirling moves with the grace of a ballerina but works the crowd into a frenzy, “dropping the beat” like a rave fairy. In October, Lindsey released her Warmer in the Winter Christmas album which scored her the highest debut for a holiday album this season thus far and featured classic and original songs with artists like Becky G and Sabrina Carpenter. In August 2016, Lindsey’s critically acclaimed third studio album Brave Enough, debuted at #5 on Billboard’s Top 200 Album Chart and went on to score the #1 spot on Billboard’s year-end Top Dance/Electronic Album list, placing ahead of dance music heavyweights Chainsmokers, Flume and Kygo. The album also had the highest selling week for an album title on the ranking chart and Lindsey herself placed at #6 on the Billboard Top Dance/Electronic Artist year-end list. Collaborations on the album include ZZ Ward, Andrew McMahon and the Wilderness, Rivers Cuomo and Christina Perri to name a few, and earned Stirling a 2017 Billboard Music Award for “Top Dance/Electronic Album”. The album’s current single “Love’s Just A Feeling” featuring up and coming songstress Rooty, recently made its powerful debut on Jimmy Kimmel Live!, and has begun to pick up traction at radio across the US. Lindsey’s professional journey began in September of 2012, with the release of her self-titled debut album. Featuring her smash hit “Crystallize,” which has racked up over 183 million YouTube views, the album reached #1 on Billboard’s Dance/Electronic Chart and Classical Album Chart, earned her a 2014 Billboard Music Award nomination for “Top Dance/Electronic Album,” and was certified Gold by the RIAA. The album reached #1 on Billboard’s Dance/Electronic Chart and Classical Album Chart and peaked at #23 on the Billboard Top 200. In 2014, Lindsey released her sophomore album Shatter Me which debuted at #2 on Billboard’s Top 200 album chart and has sold over a quarter million copies in the US. It was #2 on the Billboard Year End Dance Electronic Album Chart, #1 on the iTunes Album Chart, spent an impressive 21 weeks straight at the #1 spot on the Billboard Classical Album Chart, and was recently certified Gold by the RIAA. The album includes a collaboration with Halestorm lead singer Lzzy Hale on her smash single “Shatter Me,” which has over 76 million views on YouTube and took home the 2015 Billboard Music Award for “Top Dance/Electronic Album” of which Avicii, Disclosure, Calvin Harris and Skrillex were also nominated. In 2016, Lindsey released her first book with Simon& Schuster, a memoir called “The Only Pirate at the Party” which she co-wrote with her sister, Brook S. Passey. Released in January of 2016, the book debuted on the New York Times’ best-seller list and shares stories of Lindsey’s humble yet charmed childhood, humorous adolescence, life as a struggling musician, personal struggles with anorexia, and finally, success as a world-class entertainer. Lindsey’s critically praised concerts have sold out theaters and arenas across the globe, spanning a wide range of continents including the U.S., Europe and South America. Recently Stirling has played to packed crowds at venues such as Red Rocks Amphitheater in Denver, Chicago Theater, New York’s Central Park Summerstage and the Greek Theater in Los Angeles and to date, Lindsey’s tours have sold over 500,000 headline tickets worldwide. Currently, Lindsey is on the 25th season of “Dancing with the Stars” and next up, she will lend her likeness to a new comic book series called Sparrow, for which Lindsey teamed up with artist/writer Darick Robertson and co-writer R. Eric Lieb. Stirling is the model of a modern independent recording artist, with a symbiotic relationship with her fans. A motivational speaker in her spare time, Stirling uses her own story to show teenagers that you’ve got to have confidence in the very thing that makes you unique – then wait for the world to catch up. For more information: www.lindseystirling.com.